This e-book is on iTunes. Browse Apple for all formats. 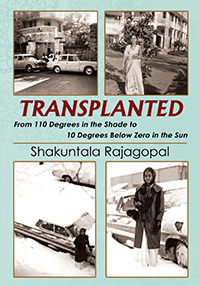 My memoir named Transplanted, from 110° F in the Shade to 10° F in the Sun, recounts my experiences as a young doctor of 23 years old who left the South Indian tropical town, Thiruananthapuram, and got dropped into a ten degrees frigid Chicago winter forty-eight hours later. Despite the strange foods I had to adjust to, the strange clothes that I needed to survive the cold, and even the strangeness of the English language (which I had hitherto believed I was well versed in,) I was able to mold my life and likes, and establish myself as a successful pathologist, a dedicated wife, strong yet kind and loving mother and grandmother, and now a Matriarch to an extended family of fifty two in Chicagoland. I can do it attitude, an open mind and willingness to grow, and the vigor with which I faced my challenges made me successful in accepting and assimilating the American heritage for my own. How I contributed to the melting pot of America while becoming part of it, is itself a story worth reading. Anybody displaced from a place of comfort, whether 100 miles or 10,000 miles, anyone seeking guidance to overcome adversities, and anyone interested in “the Immigrant story” will find my book helpful to survive adversity and prosper in a strange land or a strange town.